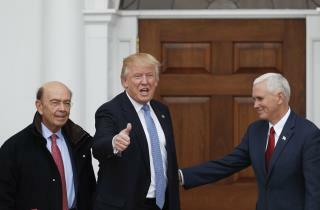 (Newser) – With many Americans wondering where all the money is, they might want to check the pockets of the new Trump cabinet. Quartz reports the 17 people Donald Trump has selected for his cabinet or cabinet-level posts have a combined wealth of more than $9.5 billion. That's more money than the bottom one-third of American households—all 43 million of them—have total. In fact, it would take 120,000 median American households—with a worth of $83,200—to equal the wealth of just the four richest members of Trump's cabinet. The Guardian calls it "the most brazen embrace of big money since the 1980s." Let's just call it the winners circle. No whiners, crybabies, or sniveling liberals allowed. Liberal whiners are upset Trump did not nominate poor uneducated liberals to his cabinet. We all know what poor liberals do when they get in office, steal everything that is not nailed down.